Virus Alert from Apple is nothing more than a scam that seeks to trick victims into calling the provided number and paying for useless services. Dealing with it can lead you to more severe damage or privacy issues. Make sure to close the fake pop-up and scan the system to remove the virus responsible for its appearance. Virus Alert from Apple virus is the scam campaign using social engineering tactics to lure people into calling the fake support number. VIRUS ALERT FROM APPLE is a scam using social engineering to scare its victims into believing fake errors that claim that technical issues, computer viruses, and similar problems were detected on the system. Typically, these pop-up alerts are displayed because of the infected web browser which was hijacked by adware. As a result, the virus alters specific settings and then displays full-screen alerts that can even lock it. The message displayed on the desktop aims to trick victims into calling questionable Apple support number which, once connected, can offer users into downloading fake software or paying for highly questionable solutions. Beware that VIRUS ALERT FROM APPLE virus has nothing to deal with Apple company and should never be taken seriously. Otherwise, you can lose your sensitive information like email addresses, phone number or even credit card information. DO NOT call the number displayed on the screen and DO NOT provide scammers any personal information. You may get Apple Support Alert redirect unexpectedly when browsing online and the message about possible errors, malicious programs or even the privacy risk scare you into thinking these errors are real. However, when you interact with the pop-up window, you get additional adware-type symptoms. Virus Alert from Apple virus is the scam that might be associated with other PUPs so fake error alerts can be followed by intrusive advertisements, commercial content, and redirects to suspicious or possibly malicious websites. MAC OS is infected with Spyware and other malicious applications. Spyware must be removed and system damage repaired.It is necessary to Call Apple Support 1-833-451-6111 and follow Virus removal procedure immediately, please proceed. Virus Alert from Apple may also lock your browser to fake the crash on the device due to the malicious infection, so the user is eager to call the fake support number. Unfortunately, people behind these scams like Apple iOS Alert or Apple Security Alert have only one purpose – to make a profit from the victims. When people call the number displayed on Virus Alert from Apple message person on the other side of the phone lures them to give the remote access to the device, perform suspicious system changes or even asks to pay for this help or subscribe for support contacts. Be aware that cybercriminals might operate Apple Support Alert scams. In most cases, the person that receives the call talks in broken English with a foreign accent and suggests questionable solutions or even asks to pay for the service. Apple Support team is never encouraging people to call any number, and the service is always free! You shouldn't reveal credit card information or personal details to suspicious people. VIRUS ALERT FROM APPLE developers asks to allow the remote access to your device that can lead to malware infections or even stolen personal data stored on the computer. Make sure to remove Virus alert from Apple as soon as you notice these error alerts. Unfortunately, exiting the browser is not enough to get rid of the main intruder that affects the whole system. You need to employ anti-malware for the job and scan the device fully. For best Virus alert from Apple removal results get a reputable antivirus program like Reimage and perform a system scan. Then, when the tool indicates all possible threats, you can remove the bunch of those intruders and fix additional issues with the computer that got discovered during the full scan on the machine. Virus Alert from Apple is the scam that relates to the adware program. Due to this association you additional encounter intrusive commercial content that fills up your screen constantly. Getting programs from the internet alone is not the worst part. The main issue is downloading software from questionable sources, deceptive websites, advertisements or p2p services. When you download programs from these sources, you risk getting additional applications and infecting your computer. Researchers always note how important it is to choose reputable sources and providers when getting tools for the PC. Also, choosing Advanced or Custom options during and installation give you the advantage of seeing all programs on the list so you can de-select unwanted ones. 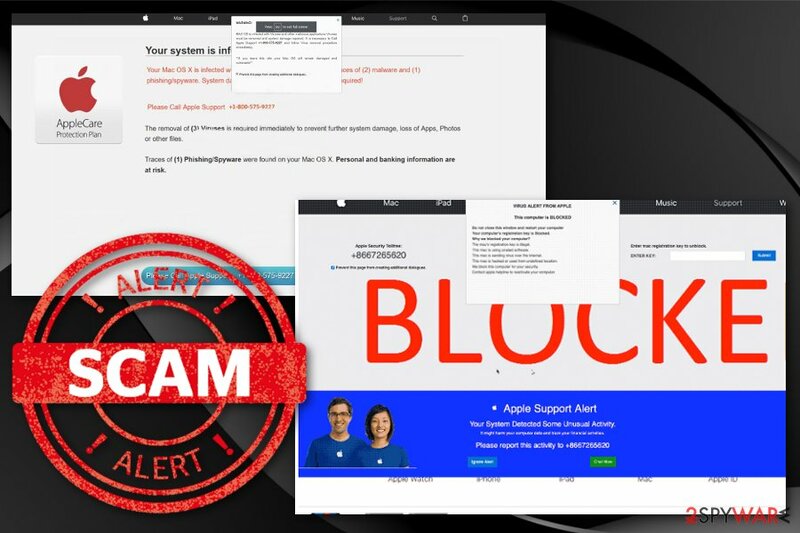 Apple Support Alert or Virus Alert from Apple virus is the scam campaign that uses questionable tactics to scare people into thinking their device is infected or full of malicious programs. You shouldn't believe any similar alerts and clean the machine thoroughly as soon as possible. There is a possibility that this program infects your device with other intruders. Therefore you need to remove VIRUS ALERT FROM APPLE using reputable anti-malware tools and employing those for a full scan of the computer. When you do so, all potential threats can be indicated and deleted completely. VIRUS ALERT FROM APPLE removal requires professional help, and when you choose automatic virus termination method instead of trying to find all related pieces and files yourself, you get a huge advantage of a better working device. Tools that we suggest can improve the performance of your Mac because all useless files and malicious programs can be eliminated during that process. Wait until you see Applications folder and look for VIRUS ALERT FROM APPLE or any other suspicious programs on it. Now right click on every of such entries and select Move to Trash. ^ Rochelle Garner. 'Apple support' phishing scams are getting really good. Cnet. Product reviews, how-tos deals and the lates tech news. ^ Potentially Unwanted Programs slow down your system and can be harmful: Here’s what can you do about it. Emisoft. 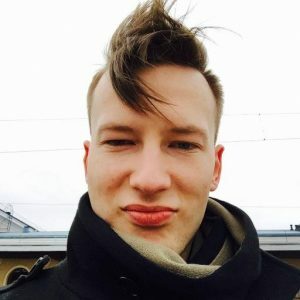 Security blog. This entry was posted on 2019-02-08 at 02:49 and is filed under Mac Viruses, Viruses. You can quickly scan the QR code with your mobile device and have VIRUS ALERT FROM APPLE manual removal instructions right in your pocket. How did you remove VIRUS ALERT FROM APPLE?